Some two miles west of the East Lothian village of Whitekirk, on a rough rock outcrop clings a few fragmented remains of the ancient castle of Waughton. Alongside is a beehive doo'cot of a later 1500's period. The earliest tower of Waughton is said to be of Saxon construction, but replaced by medieval works including a small chapel, an enclosing Barmkin wall and a lean-to tower. There are some remains of this lean-to on the west facing rock mass and originally the entire site would have been surrounded by a deep ditch to add to it's defenses. Waughton first appears during the reign of King David II of Scots (1329-1371) when it was held by the Hepburns of Waughton. It is even claimed that these Hepburns were of a more ancient line than the infamous Hepburns, Earls of Bothwell of Hailes castle i.e. James Hepburn,4th Earl of Bothwell 'Mary's Bothwell' who became Mary Queen of Scots (1542-1567/87) third husband. 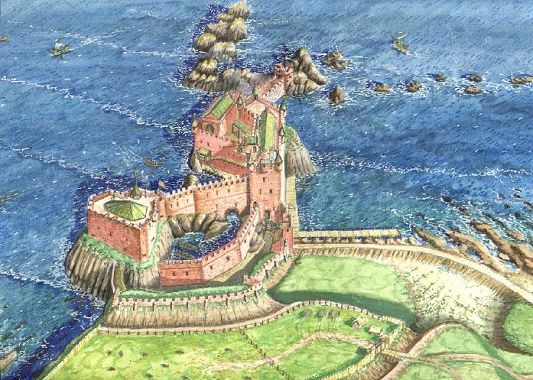 But likely both Hepburns of Waughton and the Hepburns of Hailes were kin and had a common ancestor in the Northumbrian knight 'Adam de Hepburne' who, in 1271,was captured in battle by Lord Dunbar, Earl of March of Dunbar castle. Later 'Hepburne' saved Lord Dunbar from a wild horse and was rewarded by marrying Lord Dunbar's daughter and becoming a Dunbar vassal Lord holding Hailes castle. The principal branch of the Hepburns of Waughton terminated when the Hepburn heiress married Sir Andrew Ramsay, eldest son of Sir Andrew Ramsay of Abbotshall in Fife, to whom she brought the estate of Waughton. After this Waughton castle devolved back to the Hepburns, this time the Hepburns of Smeaton. In 1451,Patrick Hepburn of Waughton obtained half of the estate of Luffness from Robert Bickerton. In 1464,Patrick claimed the other half of the estate including the castle. In 1498,David Hepburn passed Luffness and Waughton on to his son. 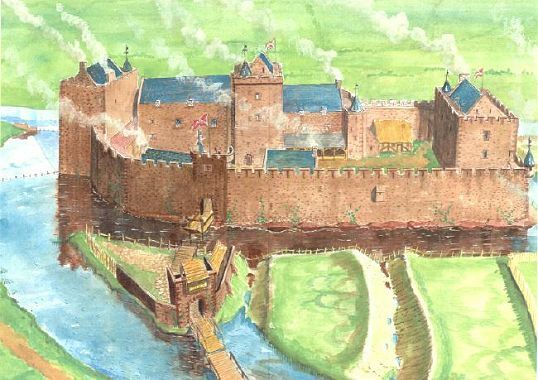 In August 1536,Patrick Hepburn of Waughton along with others was fined £1,000 by King James V of Scots (1513-1542) for repairs to his Royal castle of Blackness. By 1538,we find Patrick handing half of his lands on to his son Adam Hepburn. In 1548,during the wars of the 'Rough Wooing' ,where by use of castle burning the English hoped to force the marriage of the infant Mary Queen of Scots to the English Prince Edward. Waughton was seized by Lord Grey and local 'assured Scots' ,who favoured the marriage union with England. 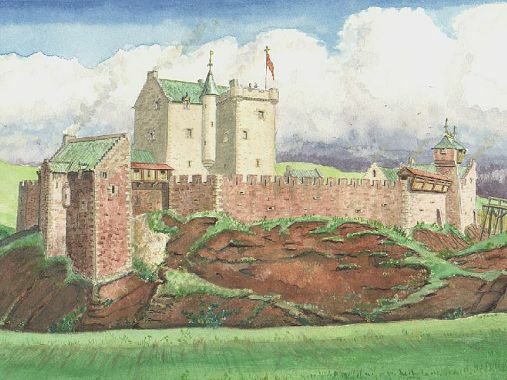 But soon the castle was retaken by the Scots and such 'assured Scots' as Douglas of Longniddry and Cockburn of Ormiston had their Towerhouses sacked for having helped the English. In 1568,the Hepburns of Waughton along with their kin from Hailes and the Hays of Yester castle massed their forces at Seton Palace in support of Mary Queen of Scots prior to the battle of Carberry near Musselburgh. During this battle, or rather more of a skirmish and stand-off. Mary surrendered to the rebel 'King's party' on condition her Husband James Hepburn, his kin and their allies be allowed to leave unmolested. Bothwell fled to Spynie Palace in the north of the Kingdom then on to Scandinavia where he died insane in the prison of Dragsholm castle. Meanwhile, Hailes passed to the Stewarts while Waughton appears to have been seized by the Carmichaels, when in 1569,it was raided by Robert Hepburn, son of the dispossessed Hepburn of Waughton. The account speaks for itself, Robert "..came to the house of Waughton and brake the stables and took sixteen horses, the laird Carmichael being captain and said keeper of Waughton. Then issued out the house and slew three of them, and divers were hurt on both parties." Waughton eventually passed back to the Heburns by legal means and in 1654,John Hepburn sold the castle and lands on to Alexander Cockburn. It appears that by the 1700's the castle was being used as a quarry to build walls and cottages locally which would explain the castles present sad state.